The developers behind the Solar Impulse solar-powered plane are trying for a twenty-four hour flight relying on collected energy stored in the batteries to stay aloft at night. With a guy named Piccard heading things, what could go wrong? 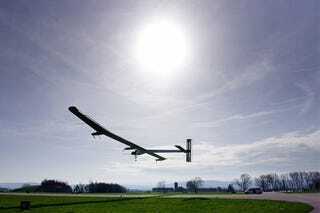 Solar Impulse first made waves (or is that particles?) back in December when they tested the flight capabilities of this 262.5-foot wide solar-powered machine. Now after some refinement they've decided to really push the plane and see if their current level of solar sophistication can deliver the goods on sustained flight. Instead of a controlled experiment, they've taken off from Payerne airfield in Switzerland with a plan to soak up the days sun while climbing to a height of 27,887 ft, then relying on battery power to stay aloft and complete a 24 hour flight cycle.